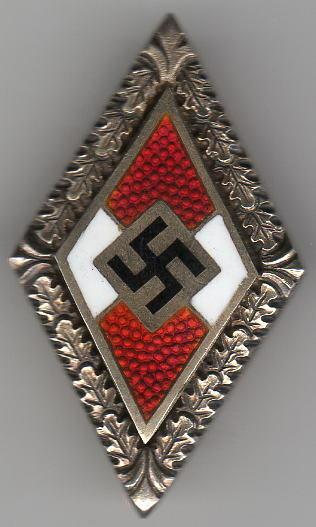 Golden Hitler Youth Honour Badge with Oak Leaves. Type A. This badge is slightly larger than the Golden Hitler Youth Honour Badge being 32 mm by 19 mm and follows the same design save that the outer border has been enhanced by the addition of a row of oak leaves, four on each side of the diamond. The oak leaves run from the bottom of the diamond were they are joined by a tie and lay over each other meeting at the top of the diamond tip to tip. This boarder is 2 mm thick. The badge is constructed in two parts, the HJ Diamond and the diamond wreath that forms the base plate. The diamond sits into the recess of the wreath. The quality of the badge is superior and is normally produced in gold with an assay mark 585, which is found on the reverse. The reverse is flat and is polished. It has a small ball hinge, with a fine needle pin. The hook is a delicate C form. Directly below the pin are two raised rivets that are filed flat on their tops. 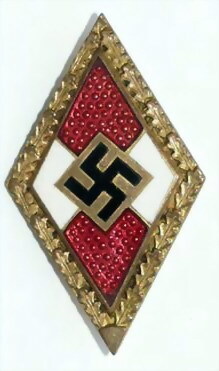 This type of badge is that which is illustrated in “Orden und Ehrenzeichen im Dritten Reich” by Dr. Heinrich Doehle. This was published in 1939. It was worn on the left breast pocket of the uniform. The award was instituted in 1935 by Balder von Schirach and was classed as a party decoration. 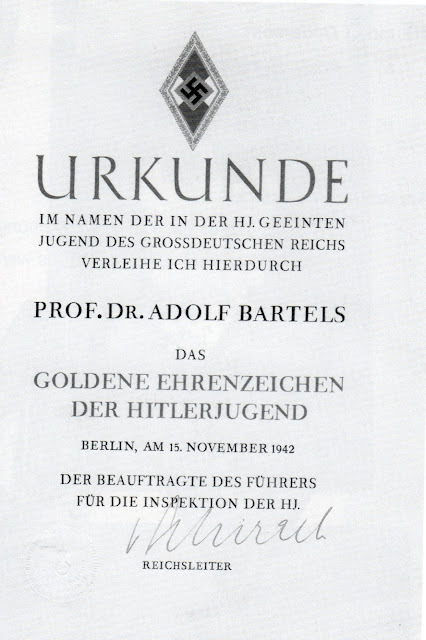 It could be awarded by Hitler and Balder von Schirach, who personally presented the award to the recipient. 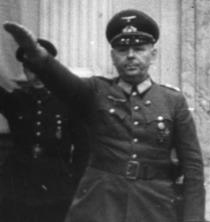 This is the only party decoration that could be awarded independently of Hitler. 1) Exceptional service in the HJ. 2) Exceptional service to the HJ. 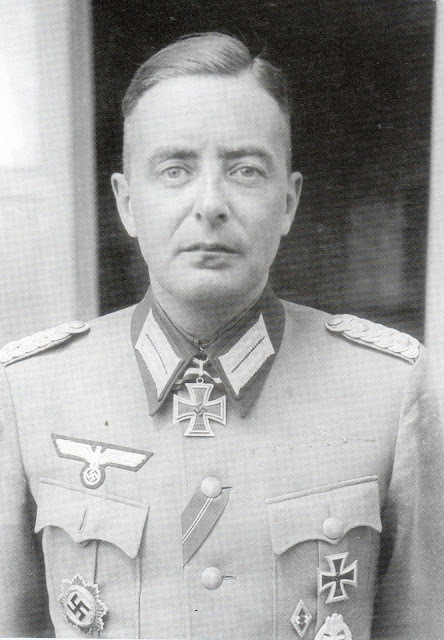 2) Germans who were not members of the Hitler Youth. 3) It could be conferred upon foreign nationals. 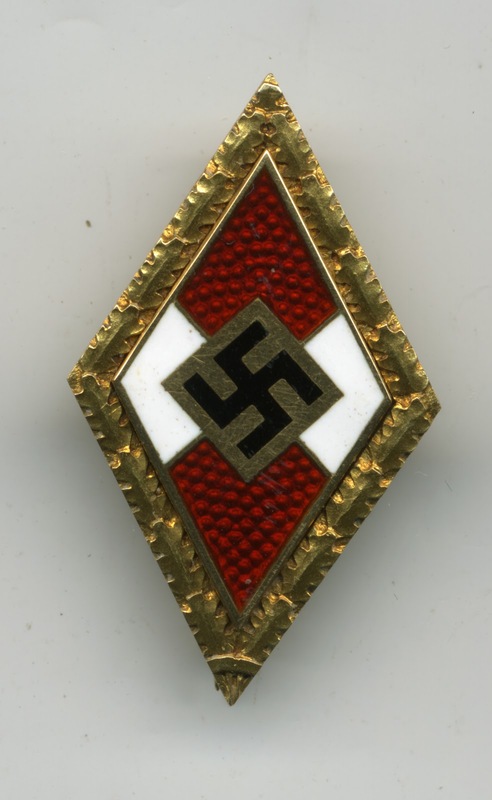 It has been estimated that no more than 250 of the badge were awarded, thus making this one of the very rare awards of the Third Reich. It was awarded with a Document in a folder. The citation was titled “Das Goldene Ehrenzeichen der Hitler Jugend”, with no mention of the addition of oak leaves, although the badge emblem on the citation clearly shows the oak leaf design. It was printed in coloured text, with the Recipients details being hand written and signed by Reichsleiter Baldur von Schirach. The presentation box is unknown to the author. 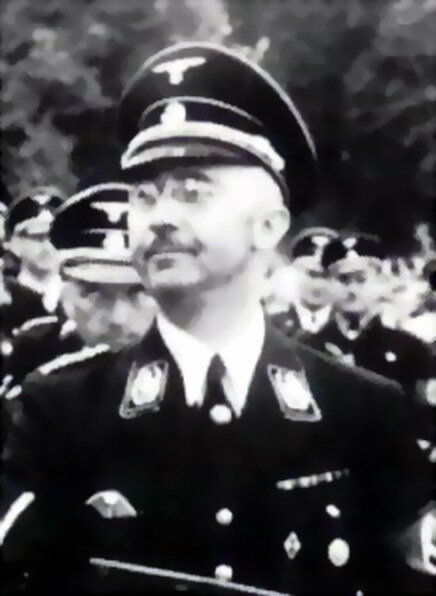 Bartels Adolf - Prof. Dr.
Himmler Heinrich - Reichsführer-SS u. Chef der Deutschen Polizei. Reinecke Hermann - General der Infanterie. Golden Hitler Youth Honour Badge with Oak Leaves. Type B. This badge is considerably larger than the Golden Hitler Youth Honour Badge and is larger than the former badge, measuring 36 mm by 21 mm and follows the same design of that badge, save that the outer border in this case has been enhanced by 4 escutcheons one at each corner of the diamond. The addition of a row of 4 oak leaves, between the esscutions, runs from the bottom tip upwards on either side of the diamond. From the apex on either side of the diamond they run downwards. This boarder is 2.5 mm thick. The badge is constructed in two parts, the HJ Diamond and the diamond wreath that forms the base plate. The diamond sits into the recess of the wreath. The quality of the badge is superior and gives the impression of having been hand engraved. It can be produce in three different forms, in gold with an assay mark 585, silver guilt with an assay mark .835, both of which are found stamped on the reverse and fine zinc. The reverse in the case of the gold and silver guilt badges is flat and polished. They have a small ball hinge, with a fine needle pin. The hook is a delicate C form. 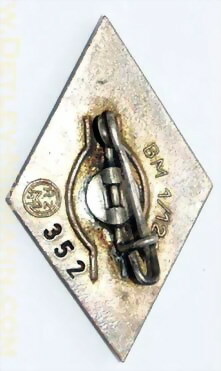 In the case of the zinc badge the pin is a one-piece safety pine type attached to the reverse by a round plate. 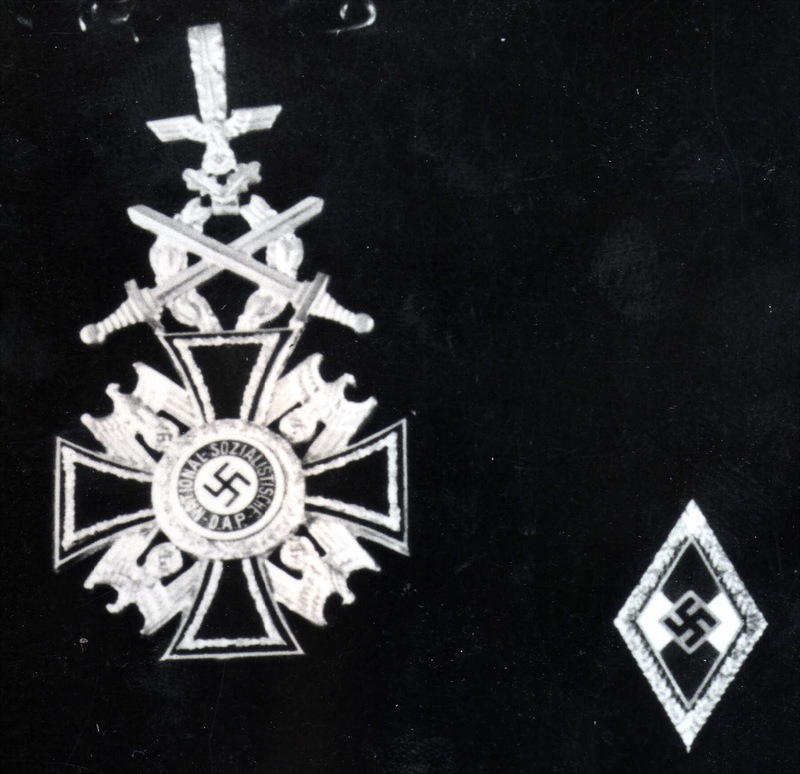 This type of badge is that which is illustrated by a picture on the funeral pillow of Dr. Fritz Todt. The funeral pillow of Dr. Fritz Todt. Close up of the award on the funeral pillow of Dr. Fritz Todt. Golden HJ Honour Badge with Oak leaves. 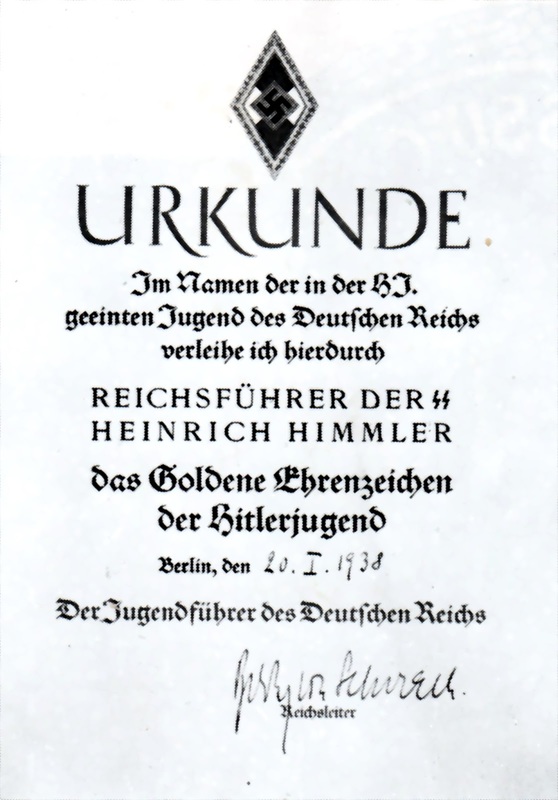 Golden Hitler Youth Honour Badge with Oak Leaves. Type C.
The reverse has a raised panel for the plate that secures the pin. 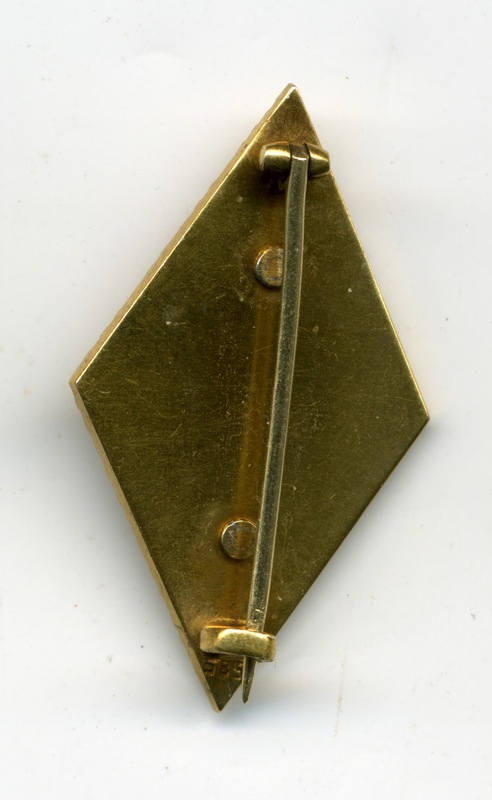 The pin is a one-piece safety pine type attached to the reverse by a round plate. The maker's code number and the RZM logo are to be found in raised characters on the left and right sides of the raised panel. 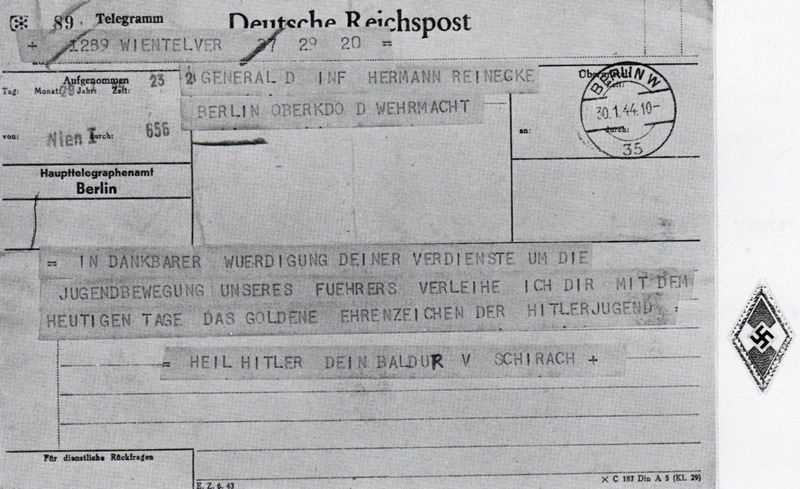 In addition an issue number is stamped into the reverse. A badge illustrated in, 'For Führer and Fatherland, Political and Civil Awards of the Third Reich', by Ltc. (Retd) John R. Angolia, that has an issue number 366, tends to indicate that more awards were made than has been previously thought. 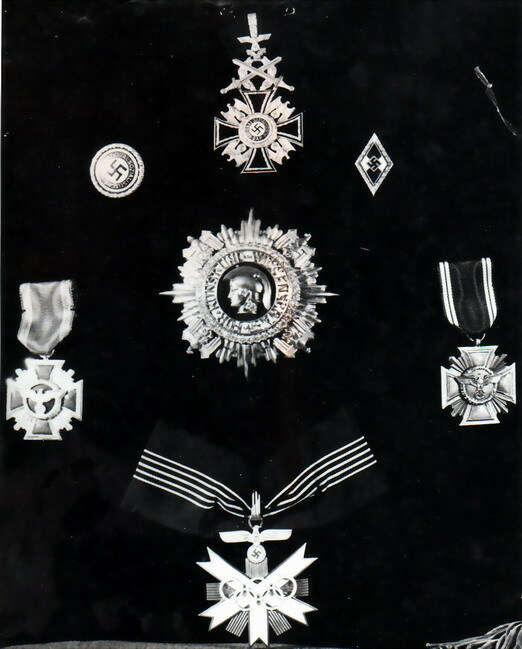 The possibility that this is a separate award cannot be ruled out and would give rise to the change in design encountered in the Type A and B badges. 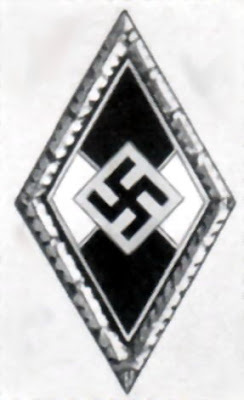 Dr Klietmann describes the badge in this form in his book Deutsche Auszeichungen, 2 Band. However this could be a fake, which is probably the most likely scenario. I have included it because it has been feature and there is no hard and fast answer to it. Numbers that have been encountered are 305, 352, 366.